Software Project Management consists of many activities, that includes planning of the project, deciding the scope of product, estimation of cost in different terms, scheduling of tasks, etc. 1. Project Planning: It is a set of multiple processes, or we can say that it a task that performed before the construction of the product starts. 2. Scope Management: It describes the scope of the project. Scope management is important because it clearly defines what would do and what would not. Scope Management create the project to contain restricted and quantitative tasks, which may merely be documented and successively avoids price and time overrun. 3. Estimation management: This is not only about cost estimation because whenever we start to develop software, but we also figure out their size(line of code), efforts, time as well as cost. If we talk about the size, then Line of code depends upon user or software requirement. If we talk about effort, we should know about the size of the software, because based on the size we can quickly estimate how big team required to produce the software. If we talk about time, when size and efforts are estimated, the time required to develop the software can easily determine. 4. Scheduling Management: Scheduling Management in software refers to all the activities to complete in the specified order and within time slotted to each activity. Project managers define multiple tasks and arrange them keeping various factors in mind. Find out multiple tasks and correlate them. Assign the respective number of work-units for every job. Calculate the total time from start to finish. Break down the project into modules. 5. Project Resource Management: In software Development, all the elements are referred to as resources for the project. It can be a human resource, productive tools, and libraries. Developing a resource plan is derived from the project plan. 6. Project Risk Management: Risk management consists of all the activities like identification, analyzing and preparing the plan for predictable and unpredictable risk in the project. The Experienced team leaves the project, and the new team joins it. Change in technologies and the environment. 7. Project Communication Management: Communication is an essential factor in the success of the project. It is a bridge between client, organization, team members and as well as other stakeholders of the project such as hardware suppliers. From the planning to closure, communication plays a vital role. In all the phases, communication must be clear and understood. Miscommunication can create a big blunder in the project. 8. 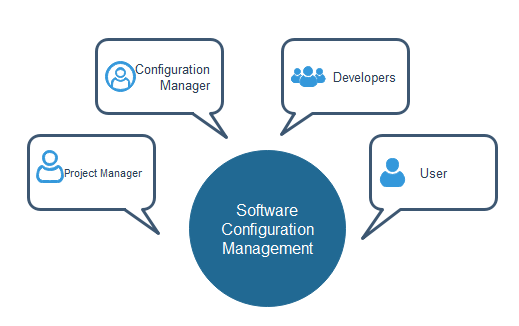 Project Configuration Management: Configuration management is about to control the changes in software like requirements, design, and development of the product. The Primary goal is to increase productivity with fewer errors. Several people work on software that is continually update. Help to build coordination among suppliers. Changes in requirement, budget, schedule need to accommodate. Software should run on multiple systems.